Danny Sullivan tweeted his plans for placing his Twitter address on his business cards. I too have been considering ways to cross promote some of my content from one platform to another. His tweet prompted me to follow through with several ideas I have had for extending my Twitter account’s reach. I have added my Twitter address to my Google Adwords Professional video on YouTube. To me, it seems only natural for YouTube producers to add their Twitter contact details to their videos. I am surprised YouTube hasn’t yet added Twitter as one of their sharing options. Surely adding Twitter to YouTube’s share options would help both properties further develop and deepen their respective shares audience attention. Connecting YouTube’s and Twitter’s audiences may provide further monetization opportunities as well. YouTube Now Considered A Google Adwords Search Partner? Over the weekend I noticed some of my clients Google Adwords ads – not YouTube Sponsored Video ads – began displaying in YouTube search results. I don’t recall seeing or selecting YouTube search as a distribution option in my Adwords dashboard. However, I think distributing brand related keyword ads to YouTube search results is a logical evolution in both the Google Adwords text ad distribution platform and YouTube search. 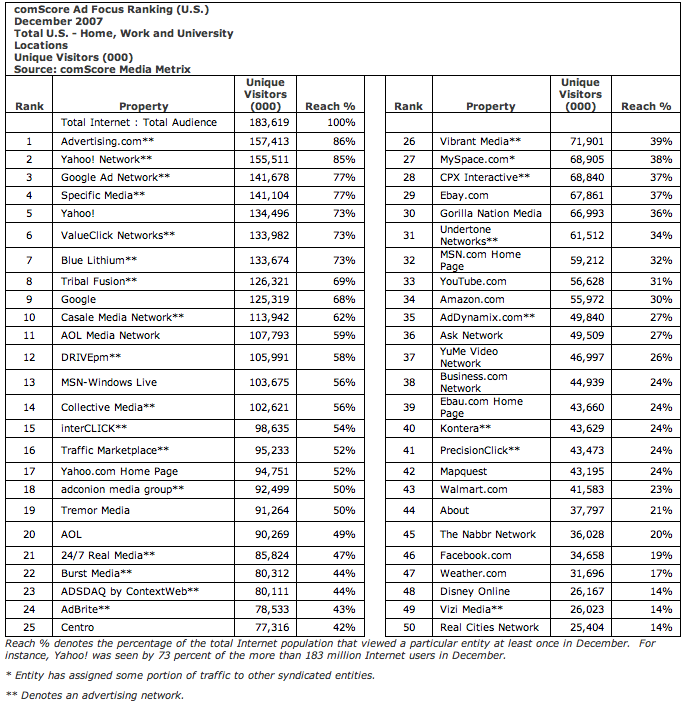 According to comScore, if YouTube were to stand alone it would be the second largest searched site after Google itself. Where will Adwords advertisers soon find YouTube as an ad distribution option in their Adwords account? Will they find it under the Networks and Bidding options? Or will we see it after learning about the Google Search Network? Unless of course, Google’s ownership of YouTube doesn’t technically require them to identify and disclose YouTube as a search partner. I guess Google’s considering YouTube an extended part of Google search would still be technically correct. Won’t we soon learn which path Google has chosen? My Google Keyword Suggestion Tool video on YouTube is attracting one of the oldest audience segments YouTube reaches. 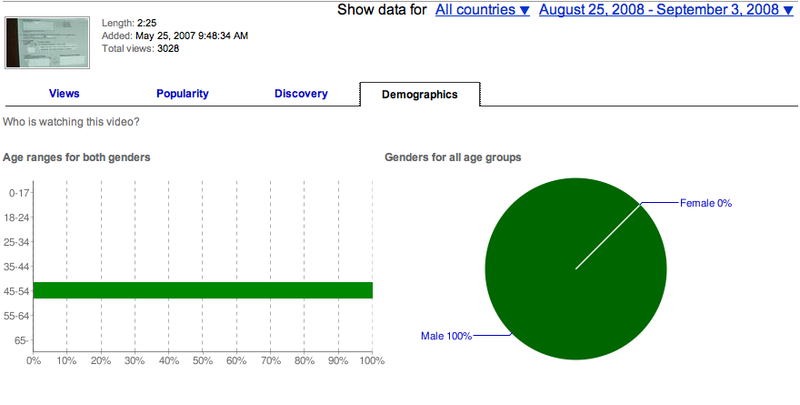 According to Insight, YouTube’s statistics package, 100% of YouTube viewers of my 2:25 minute Google Keyword Suggestion tool video within the last 30 days were 45-54 year old males. Not 50% or 80% but 100%. If women aren’t watching keyword suggestion tool videos on YouTube, I wonder what types of videos women are watching on YouTube? YouTube Insight statistics also provide data on a video’s popularity within a country and how it was discovered through its source of views “discovery” tab. YouTube Insight provides statistics to everyone who publishes their videos on YouTube. Get insight into how your videos are performing by logging into your account and clicking on “My Videos”. Each video has a dashboard with Play, Edit, Annotations and Insight buttons. Click on Insight to learn how each of your videos are performing on YouTube. After nearly ten years of driving the same car, I recently bought a new one. I decided to sell my old car the new way – online. Having been on the web now for nearly a decade, I have found a lot of inefficiencies remain when it comes time to bridge the gap between generating a lead online and closing a high ticket sale offline. When it comes to selling cars online there are several options. eBay Motors and AutoTrader.com were the two resources that came to mind. Up until yesterday, I didn’t have an eBay account so eBay Motors wasn’t an option. If I recall though, eBay Motors is the largest single used “car dealer” in the world – last time I looked I think they generated $2 Billion in car sales annually. I have an older Mercedes and because of its limited appeal, I sought the advice of a local used car dealer on how best to go about selling it. I set up an account and got my car advertised online within a day and then in the local Auto Trader print publication within a week. I started getting calls soon after my ad came out and then slowly came to realize some of the aforementioned online lead to offline sale time related inefficiencies. The internet is great for connecting sellers with buyers they wouldn’t have otherwise likely ever met, however when it comes time to sell something large and physical it presents a whole new set of problems. Half of the inquiries I received about the car resulted in the callers desire to see and test drive the car. Well, I am not a car salesman and I don’t have time to drop everything I am doing to go show a car at unpredictable times of the weekday. Scheduling time to meet potential buyers on the weekend is even more difficult. The problem: How can I “show” my car to prospective buyers without having to take an hour or two of my time to do it? My answer: Produce a short video clip of the car that shows its condition to prospective buyers and post it on YouTube. Prospects can then “look” over the car without either of us having to physically meet to do it. I shot a couple of minutes of video and then posted it in my YouTube account. 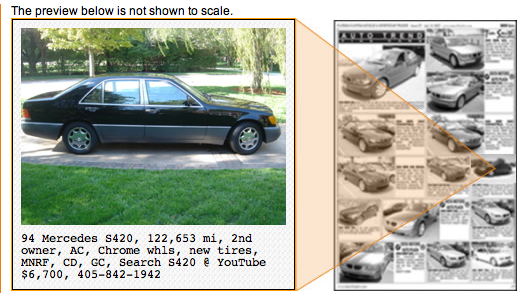 I also modified both my online and print AutoTrader ads to include “Search YouTube” to see this car. The video has been up a week and according to YouTube’s insight feature the video has already been viewed over 100 times primarily from searches within YouTube. 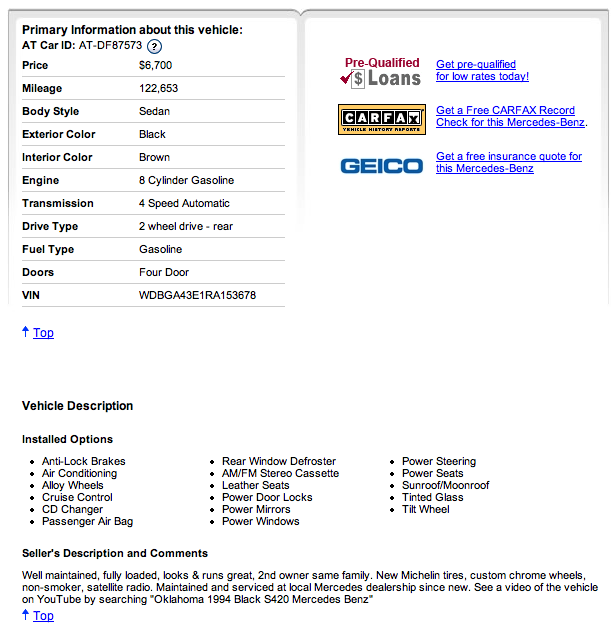 I have also posted a Craigslist ad for my car. It too mentions viewing the car online beforehand by searching for it in YouTube. Now whenever I get a call about the car, I ask them whether they have seen it on YouTube or not and then direct them to its YouTube page to see it first before we arrange a time to test drive it. Using YouTube to preview used cars for sale reduces the inefficiencies of showing vehicles to non buyers while further qualifiing the prospects most interested in potentially buying my car. I have set a couple of appointments for prospects to test drive my car this weekend. Regardless of whether the car gets sold this weekend or not, I haven’t wasted my time showing it to someone who hasn’t already convinced me they are a highly qualified –ie., interested – prospective buyer . YouTube.com is now providing YouTube video publishers with a light version of Google Analytics. YouTube analytics supply the number of views each video within an account have generated over a 5 day, 1 month, 3 month, 6 month, one year or “all time” period. The YouTube “Views by country” feauture shows how YouTube.com truly has global reach. 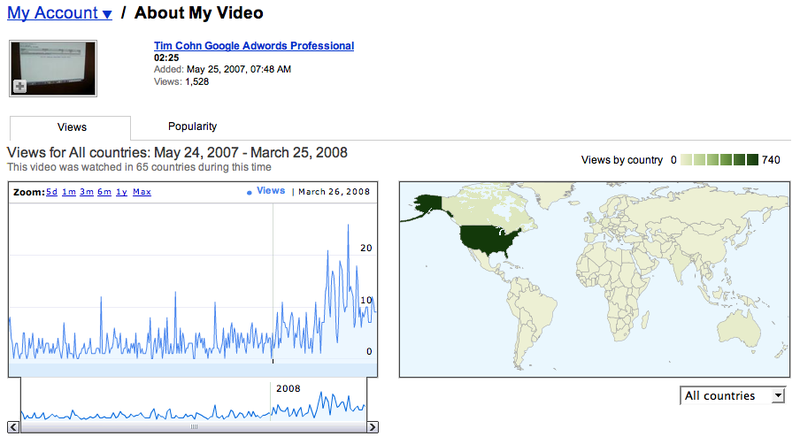 My Google Adwords keyword suggestion tool video analytics show how YouTube has served my video to searchers in 65 countries. The other main YouTube analytics feature shows how popular a video is within territories. Popularity is 100 for the most watched video in a territory and 0 for the least watched. By providing YouTube Video publishers with stats on how their videos are performing, YouTube.com has begun the process of transforming the Tuberati into not only video producers but also video marketers. Barry Schwartz provides greater detail on how YouTube Video Analytics work at Search Engine Land. Over the last several weeks, I have begun to see an occasional You Tube video clip or two in Google search results. 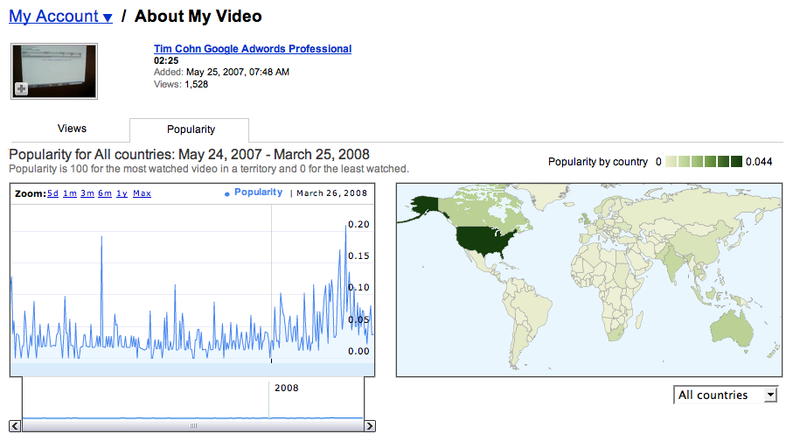 A video I posted on You Tube on May 27, 2007 and tagged with Google Adwords Professional is now appearing in Google search results as of today June 7, 2007. It will be interesting to see how You Tube videos compete for page positions with their text counterparts. Not only is Ask.com buying banner ads on YouTube so is Microsoft’s Live. While searching for a video clip today I noticed Ask.com is buying banner ads on YouTube.com. 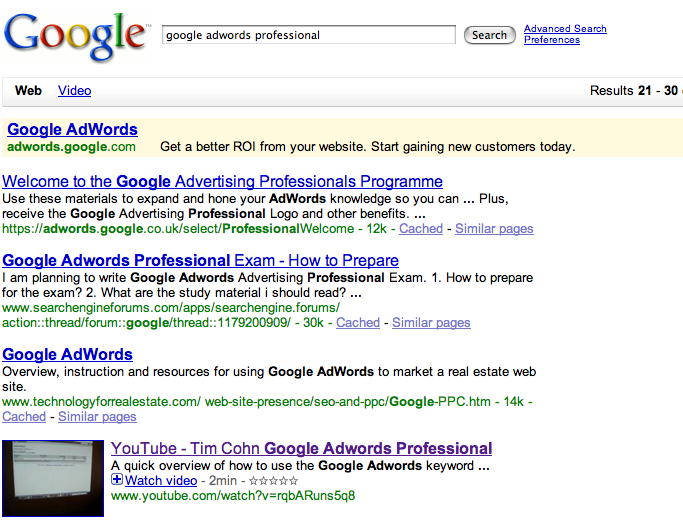 I wonder if Ask makes their money back from YouTube after searches at Ask.com deliver Google search network ads?